Stunning brand new one bedroom self catering accommodation created from a barn conversion and designed to be a home away from home. All the amenities and comfort you could wish for and situated on the Lyme Bay coast for easy access to all the attractions of the area and the amazing coastline. Lyme Barn looks south towards the coast and to the back of Golden Cap, the highest point of the south coast. 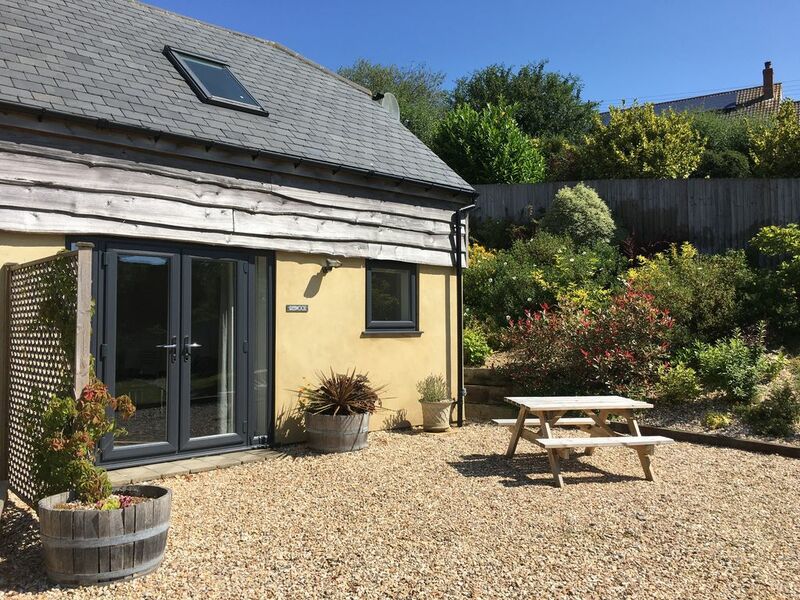 Lyme Barn is perfect for exploring the incredible West Dorset coastline, whether you would like to walk the coastal path or visit the sites and places, such as Lyme Regis, that make this area one of the most beautiful places in the world. Tastefully designed modern accommodation for two less than a mile from the World Heritage Coastline and the coastal footpath and less than 6 miles from Lyme Regis. Looking southwards towards the sea and Golden Cap, the highest point on the south coast of England. Situated in the village of Morcombelake with a post office & general store, Farm Shop and Cafe and and Art Gallery. Under 6 miles from Lyme Regis, close to Bridport with its famous street markets and West Bay (the home of the Broadchurch TV series). Close to the coastal road with frequent buses. Free Wi-Fi, 40" HD TV, Freesat with On Demand Services (such as BBC iPlayer), Bluray/DVD player and a Hi-Fi system with Blue-tooth connectability. The ground floor has a fully equipped kitchen (complete with dishwasher and washing machine), dining and lounge area leading through the patio doors to the garden. The first floor has a spacious double bedroom with views towards the sea with an ensuite shower room. Large Garden area for summer nights with your own picnic bench. Private Parking Space per cottage. I have known this beautiful part of West Dorset since 1976 when my parents took me on holiday here, that was 40 years ago and I have never got tired of the views, the walks, the atmosphere and the relaxation. Like my guests, I have stayed in many self catering properties and I have made sure that this one truly creates a home from home. I am very particular about maintaining very high standards. I want my guests to feel as though they are the first ones to stay here. Greenwood is only a 10 minute walk from the coastal footpath, which leads directly to Golden Cap, the highest point on the south coast of England. It is ideally located for Lyme Regis, Bridport and West Bay (Broadchurch) and well as a great many other places and attractions. The property benefits from high speed wi-fi and a 40" HD flat screen TV. Easy access to the coastal footpath and stunning coastal views. Frequent coastal buses run within easy walking distance of the property. A refrigerator with an icebox. This converted barn, which is well equipped and in very good decorative order, is ideal for a couple wanting a quiet time together. It has a decent sized garden with picnic tables and easy foot access to Morcombelake Village via a gate at the back of the garden. It is also well placed for visits to Lyme Regis, Charmouth and further afield to places such as Weymouth and Seaton. Nice comfortable high specification cottage ideally located to Dorset resorts and other places of interest. A very enjoyable break close to farm shop and tea room. Many thanks for your kind review. I am very pleased you had a great time. Greenwood is spotlessly clean, extremely well equipped and well designed accommodation. There is an attention to detail that is rare to find. We both loved our stay and wouldn't hesitate to return. Thank you so much. I very much hope you will consider staying with us again. First class accommodation in a fantastic location!